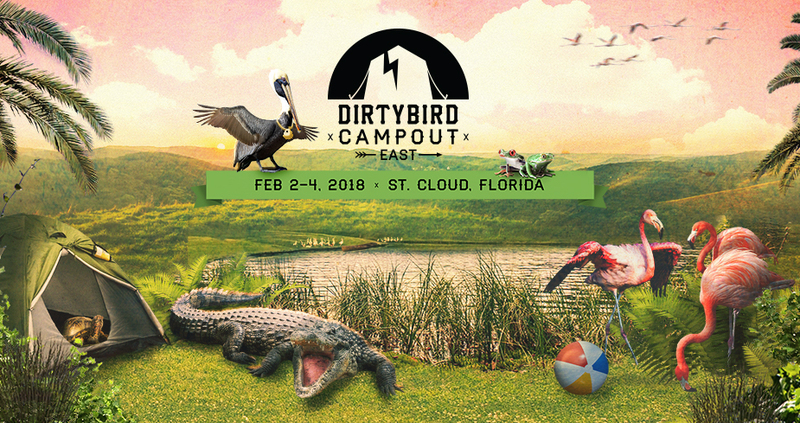 The East Coast version of Dirtybird Campout is the label’s fourth festival and an indication the group shows no signs of slowing down. This time around they are taking their talents to the east and the diehard fans are showing they are ready to flock to wherever the party is. This event’s got a lot to offer so let’s just get right into it. Alligator Wrestling: Seriously, do I have to say more? Ax Throwing Demo & Workshop: Channel your inner Paul Bunyan and comfortable with an ax. Lap Dance For Your Life: This video from Justin Martin tells you all you need to see to convince you. Don’t forget to also visit the Games HQ center and get assigned a team early on (Go team Green!). Dirtybird hands out some snazzy bandanas to help you rep your crew. New to the mix this year, the obstacle course! That’s one way to show us how dirty you’re truly willing to get. Click here for a full lineup of games and activities sure to meet everyone’s flavor. I’m lucky to have attended every west coast rendition of the festival to date and I should say, this lineup is the most amazing yet. It’s jam packed with the same names you’ve learned to love from the beginning with favorites like Justin Martin, Will Clarke and Claude VonStroke in attendance. This year’s rendition adds a diverse group of music showcases to the mix that take it higher. These include Green Velvet’s La La Land, Keinemusik, Brazil Team, This Ain’t Bristol, and Crew Love. If you weren’t satisfied yet, Dirtybird flexes it’s curating muscle with acts like long time label friends Destructo and Mija, bass heavy artists like Stooki Sound and Eprom, and Drum and Bass legends LTJ Bukem and Roni Size. This festival is also known for springing up some surprise sets (crossing my fingers for another DnB laced Martin Brothers set) and while you never know when one might happen Billy Kenny has been gracious enough to give those with open ears and eyes a heads up about a renegade set (see below). If you haven’t gotten your ticket yet, what are you waiting for. Come join the rest of the birds and bring your weirdest costumes. I seriously can’t wait, see you in St. Cloud, Florida!